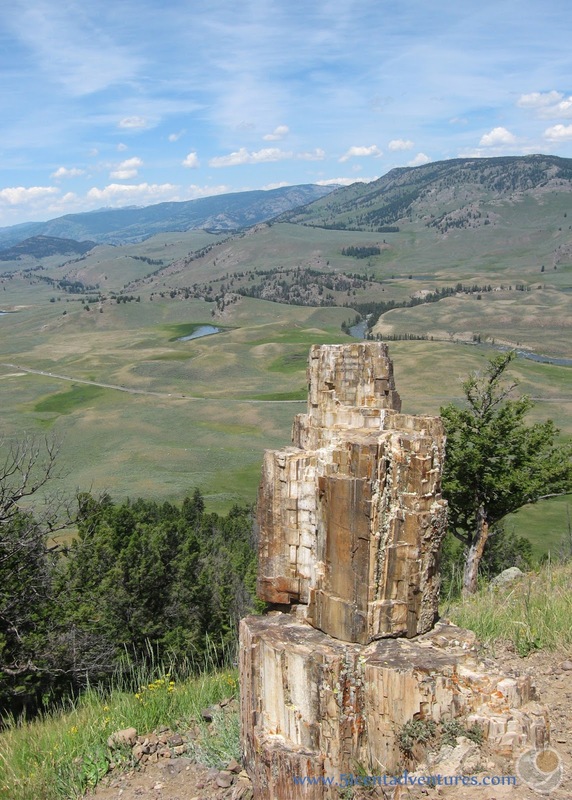 Most people think that there is only one petrified tree in Yellowstone National Park. 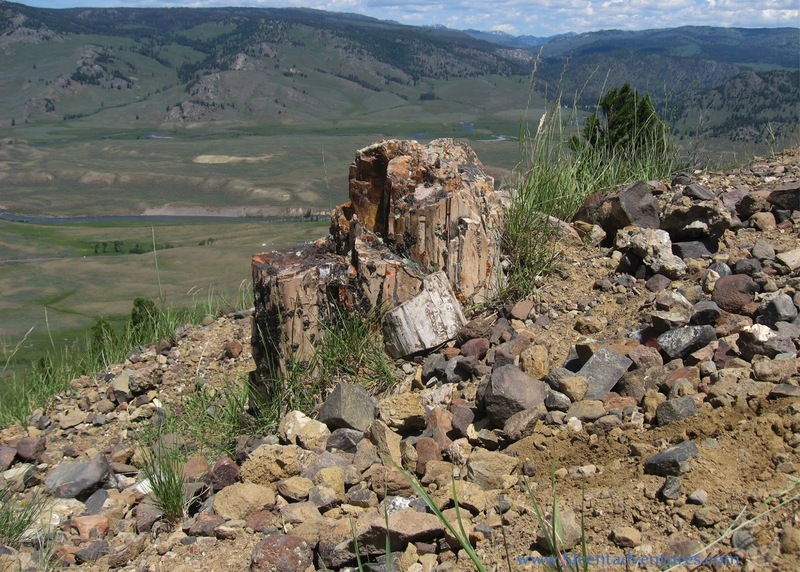 However, Yellowstone actually has the largest petrified forest in the world. These fossilized trees are massive and are worth the effort to find if you have the time and the stamina. 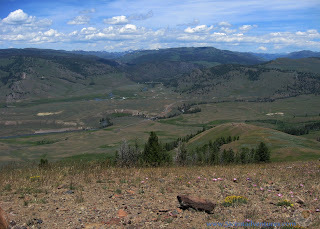 Location: Along the Lamar Valley Road that leads to the Northeast Entrance. The actual trail head is a small parking lot/pullout located on the south side of the road about .02 of a mile west of the bridge over the Lamar River. There is no official trail head marking for this trail. Hiking Distance and Time: 3 miles round trip. Plan for 2 to 4 hours. Operating Season: June through September after the snow has melted. Make sure you aren't hiking during the heat of the day. In the summer of 2017 I received a job with Xanterra Parks and Resorts in Yellowstone National Park. 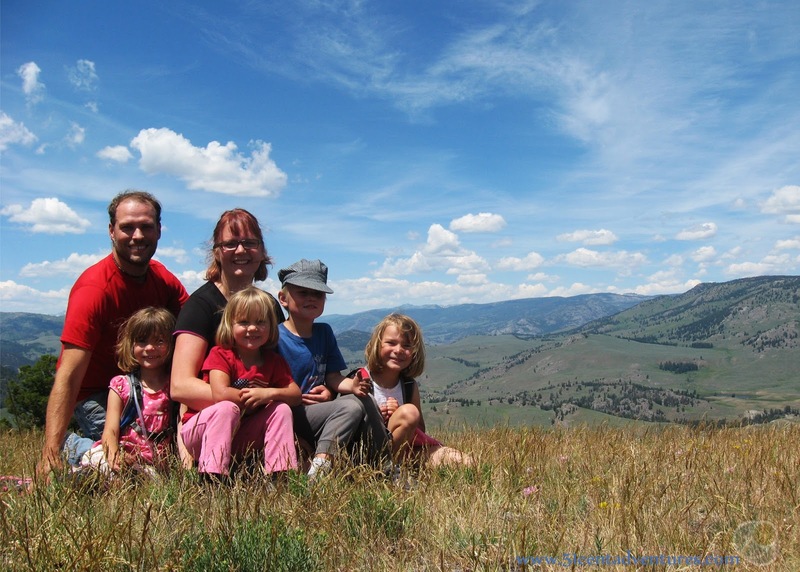 I moved there with my husband and our four young children. 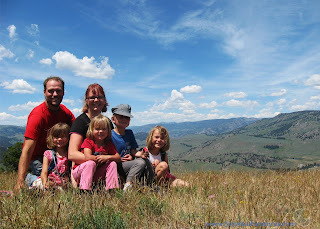 We lived in a 25 foot RV and spent all our free time exploring the park. 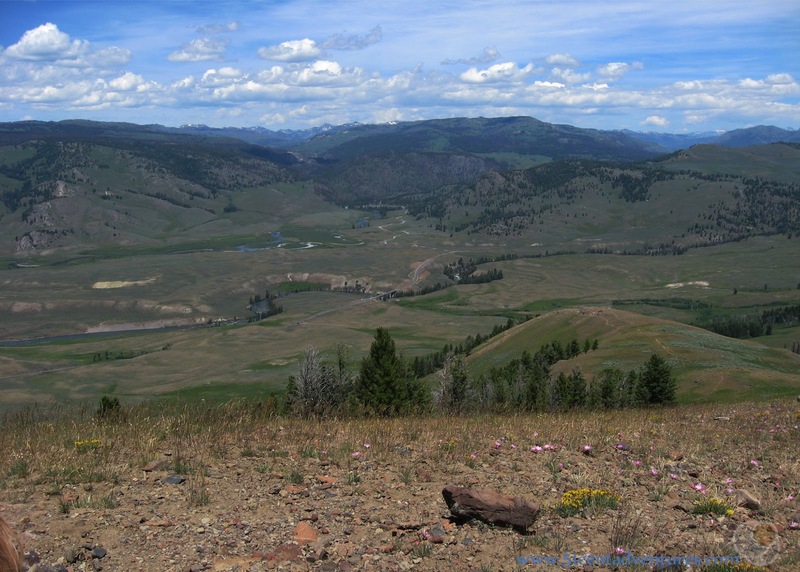 This is the second of many posts that I will write about specific features within Yellowstone National Park. At first these aren't going to be in any particular order, but in a few months I'll start grouping them into lists. This one would probably fit into a list such as "See this, not that" or something like that. The picture on the left is of a huge petrified stump from a 50 million year old Redwood tree. 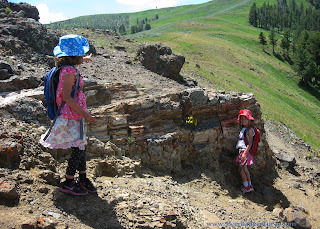 We found this giant fossil after a hard - yet rewarding - hike that took us close to many petrified tree specimens. 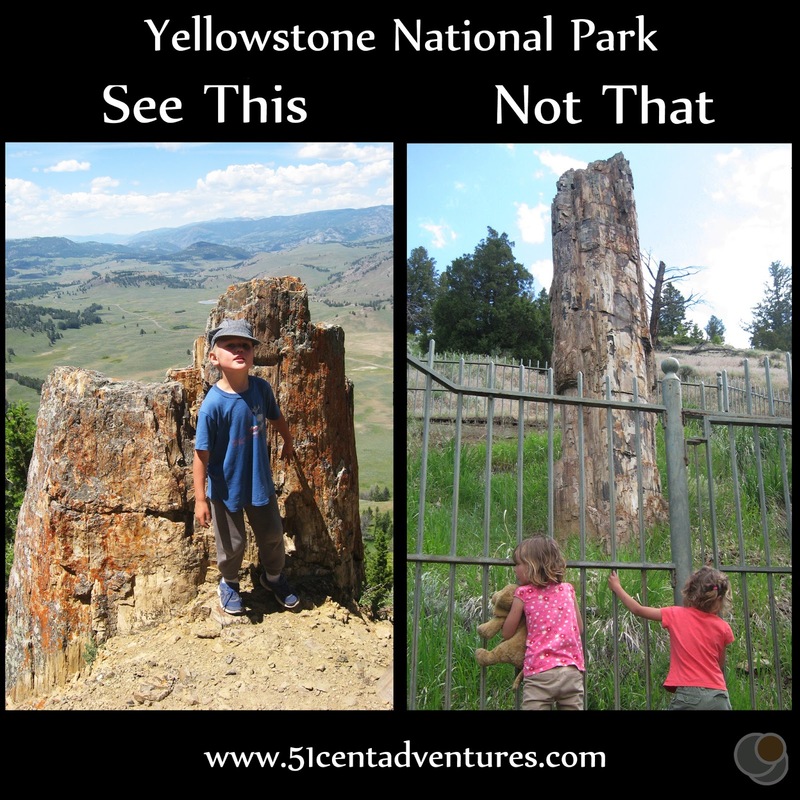 The other picture is of "The Petrified Tree" that most people think of when they think of petrified trees in Yellowstone. It's easy to reach (if parking isn't awful) and yet is somewhat anti-climactic. The fence around the tree doesn't help matters. Today I want to talk about how to find the some of the best petrified trees in Yellowstone National Park. But be warned. They are not easy to reach. This hike is extremely hard and should only be attempted if you meet three main criteria. 1. You are physically fit enough for lots of uphill (and then downhill) hiking, 2. You start this hike before 10:00 am, and 3. You bring enough water. 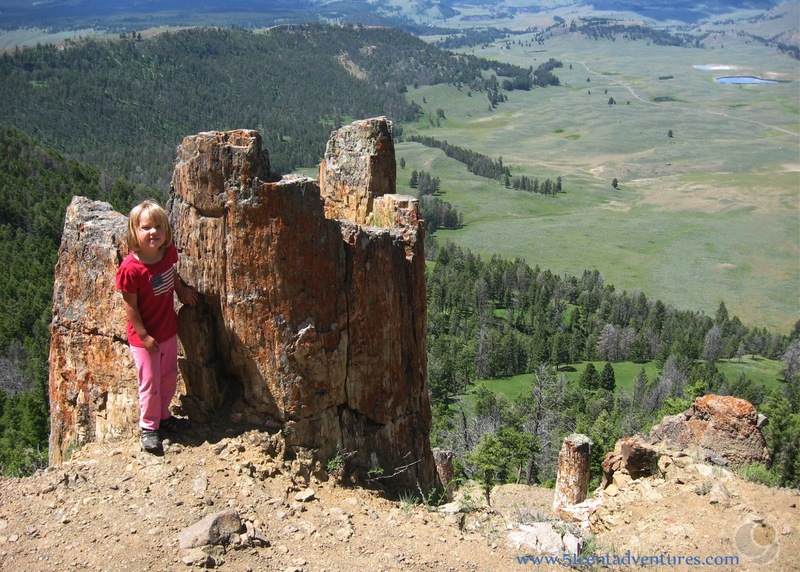 If you don't fit that criteria you are going to have a miserable time on this hike and you will not make it to any of the petrified trees. 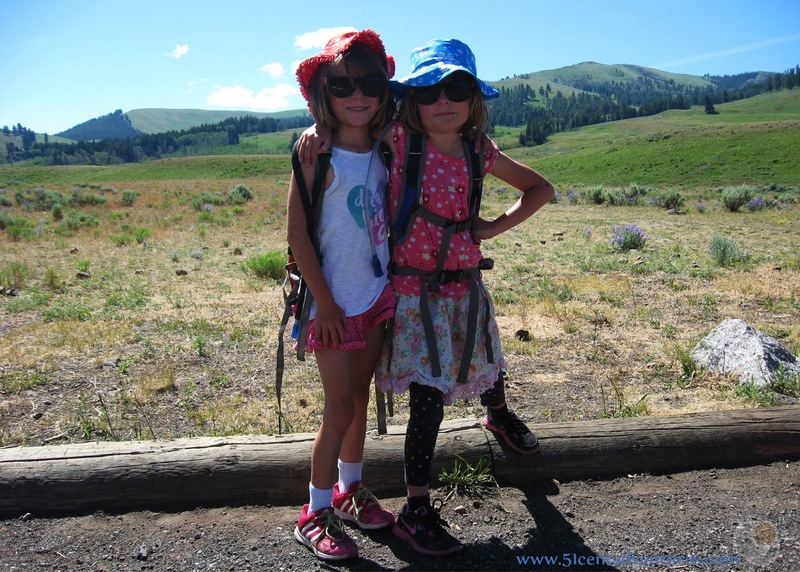 The day before we hiked to the Petrified Trees my husband and I had taken our kids on the nearly 5 mile round trip hike to Lone Star Geyser. It had been our longest hike ever, and it had gone so well that that the next day we decided to go on another long back-country hike. At first we considered that it was time to attempt to summit Mt Washburn, but that's a seven mile hike. I wasn't sure if we were ready for that yet so I picked a shorter hike: The 3 mile hike to the Petrified Trees. 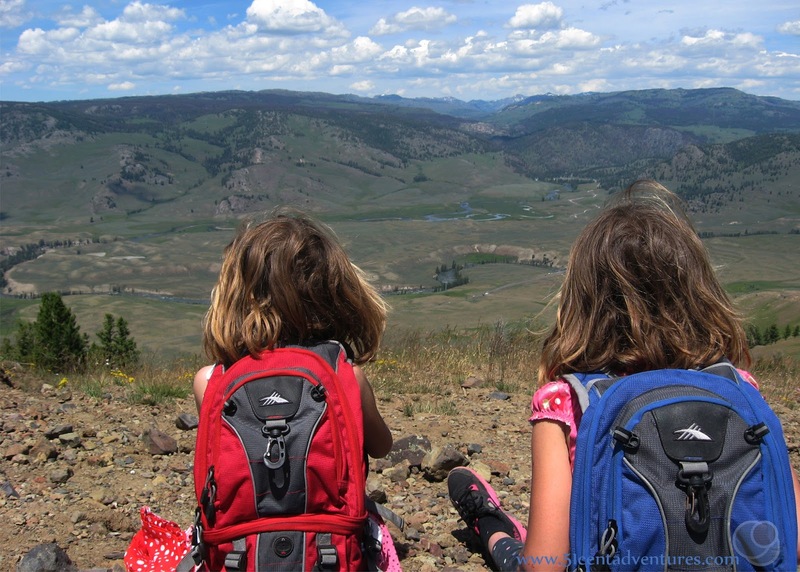 I read about this hike in the guidebook, A Ranger's Guide to Yellowstone Day Hikes by Roger Anderson and Carol Shively Anderson. The book said: "There are a number of fossil forests in Yellowstone and a number of trails that will take you to them This is one of the shortest, most direct routes." What I didn't realize is that in this case "most direct" was code for STEEP. Here are the twins posing at the trail head. This is one of my all time favorite pictures of them together. I love how they look ready for any adventure. 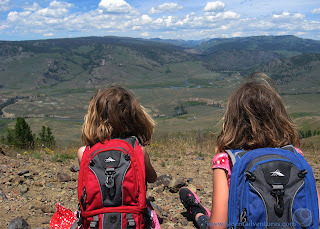 By the end of the day these girls (and our other two kids) would see parts of Yellowstone that few adults reach. The first part of the hike had no shade. I'm glad we started early enough in the day that we didn't get too hot. The trail started out level, but gradually it got steeper, and steeper, and steeper. After about a mile the trail basically went straight up a hill with very few switch backs. Even the switch backs had steep sections. If it wasn't for the promise of petrified trees at the top I would have turned around. But we kept going. The guide book didn't give great directions on how to find the fossils. It did say to go to the right when we reached a fork in the road, but it failed to account for how many forks we would reach. Basically we just went right ever time we had a choice. After about an hour and a half of hiking we found our first petrified tree stump. 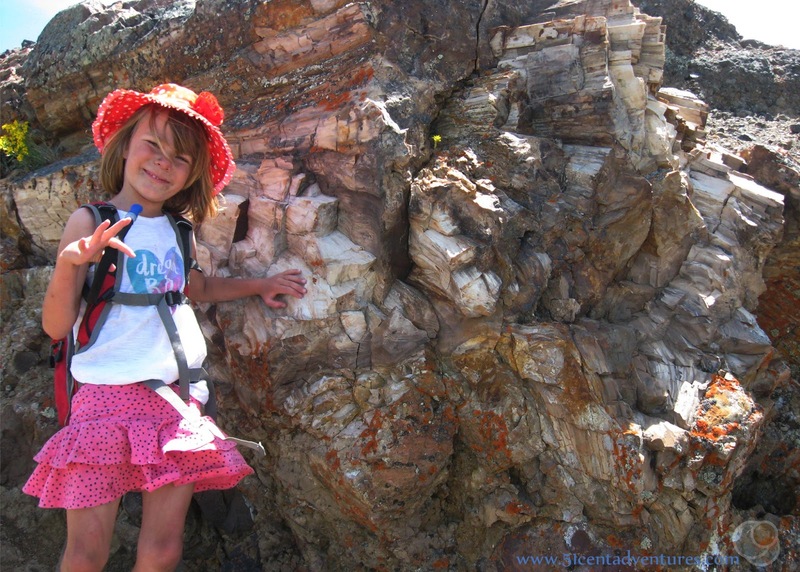 I'm not entirely sure how legal it was to touch (or climb on) these specimens, but at the time we were so happy to see petrified wood that we weren't thinking about things like that. We considered ourselves rewarded when we came to an area that had 4 stumps within a short distance of each other. 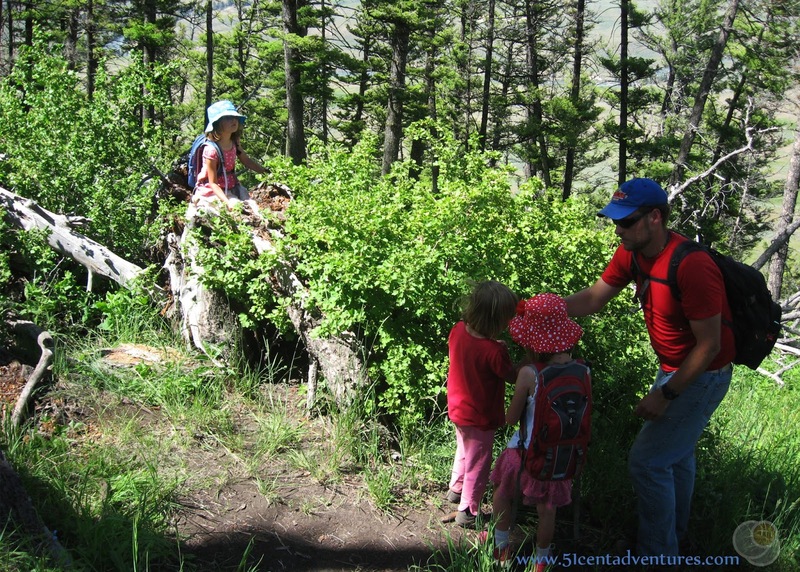 I had each of the kids stand by a stump so they would be easy to point out in this picture. Here's the big stump by itself. I was pretty content with seeing this stump and thought that maybe we should start heading down the mountain again. But my husband wanted to hike to the top of the ridge. Here's another stump near the top of the ridge. We scrambled over loose stones and climbed to the top where we discovered a HUGE petrified log. It was laying on its side and partially buried by the hill. The end of the tree was so interesting to look at. The only other place I've seen this large of a petrified tree was at the Florissant Fossil Beds National Monument in Colorado. I remembered that the guide book had mentioned this log. I pulled out the book to see if I'd forgotten about any other trees. After reading a few lines I realized we weren't even close to done. The book said there was a large, upright tree located farther up the trail. So we decided to keep going. But first we stopped for a family picture. This later became our Christmas Card for the year. I picked this one because the kids looked so happy and the background is just jaw dropping. The kids did great on the hike. We kept them going with snacks every so often. Here they are walking through flowers. (We'd already taken the family picture by this point or else we would have stopped and taken another family picture in the middle of all these flowers. The trail between the large log and the big petrified tree was much more level than any other part of the trail. It took us along the ridge line and through a small wooded area. 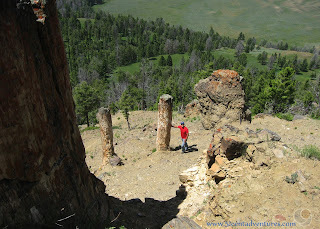 The woods opened up again and we could see the big petrified tree. Or rather it's stump. According to the guide book it was 26 feet in circumference. 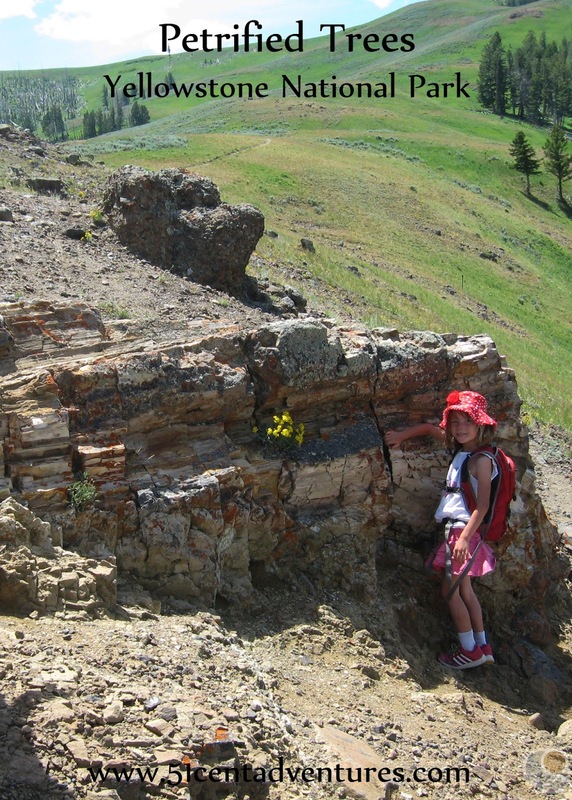 It was a Redwood tree that lived 50 million years ago. I like the juxtaposition between my three year old and something that was 50 million years old. And that's not all. There were two tall and skinny stumps located below the tree. My husband scrambled down there to pose with the remains of those trees. 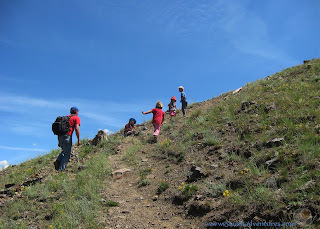 We hiked up one last steep trail and came out almost at the top of the mountain. This is our view while we ate lunch. Quite the sight. You can just barely make out our car down below. As we'd hiked we'd seen several other hikers attempt the climb. A few people made it to the big log, but none went beyond that point. 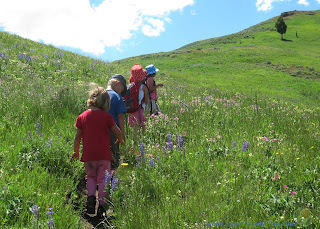 We congratulated our kids on being tough little hikers. The trail had gained 1500 feet over the course of 1.5 miles. Whew! Getting down was actually harder than going up because we had to be more careful with our footing. 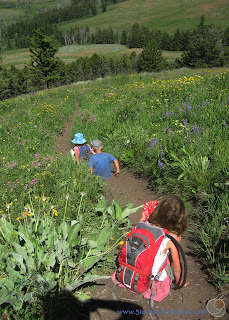 The kids found it easier to slide down on their bums most of the time. My husband and I did that a few times too. (And a some of those times were actually planned.) By the time we got back to the car my toes hurt so bad from being squished into the tips of my shoes. Still we had a lot of fun. One thing that kids remember best is when we stopped at this gooseberry bush and everyone ate gooseberries for the first time. They are kind of like Nature's Warhead candy. The hike had been grueling, but it had definitely been worth it. Most visitors to Yellowstone only see the petrified tree that is kept behind a fence. Very few see these trees. It took us several days to recover from the hike. I was actually happy to go back to work the next day because it meant I could rest. 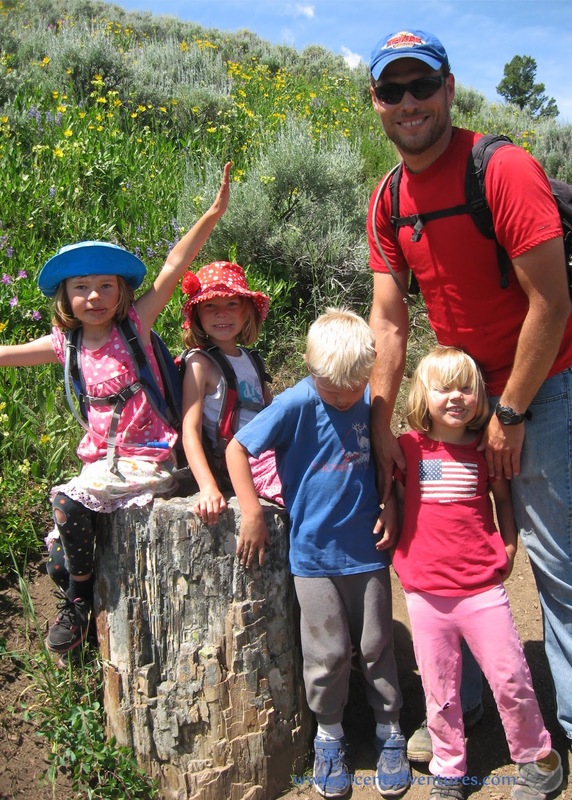 But I was also feeling pretty confident that my family could do the seven mile hike to the summit of Mount Washburn. 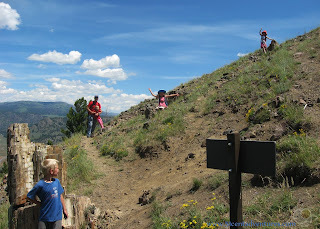 Even though that hike would be twice as long, it had switchbacks that would make it less grueling than our uphill climb to the Petrified Trees. 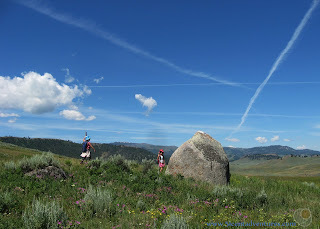 Recommendation: I do not recommend the hike to the petrified trees to everyone. 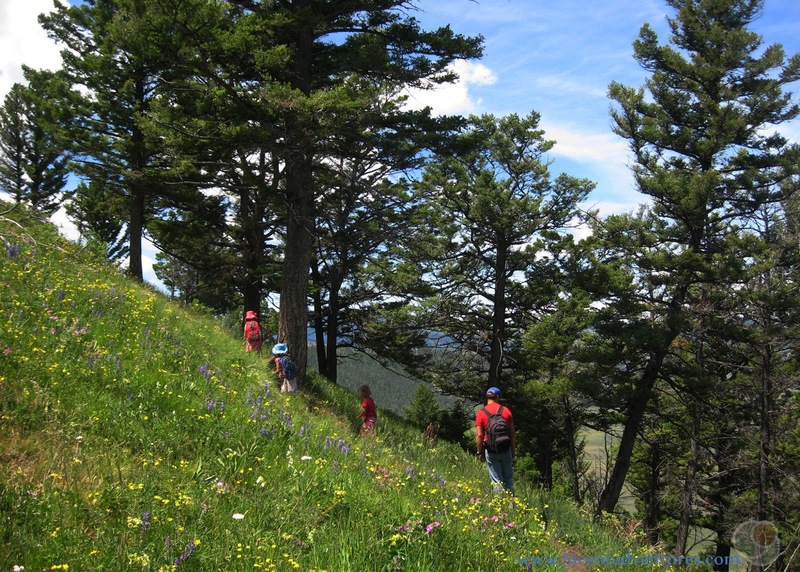 It is definitely rigorous, but if you think you have the stamina, seeing the trees will make the hike worth it. This is one of those hikes that is very fun to tell people about afterward. Directions: Perhaps the hardest part about this hike is finding the trail head. I've marked it on this map. It is 5.3 miles East of the turn off from Tower Junction and .02 miles west of the Bridge over the Lamar River. The GPS coordinates are 44.911811, -110.327940. The trail leads south (and straight up the hill) from the parking lot. 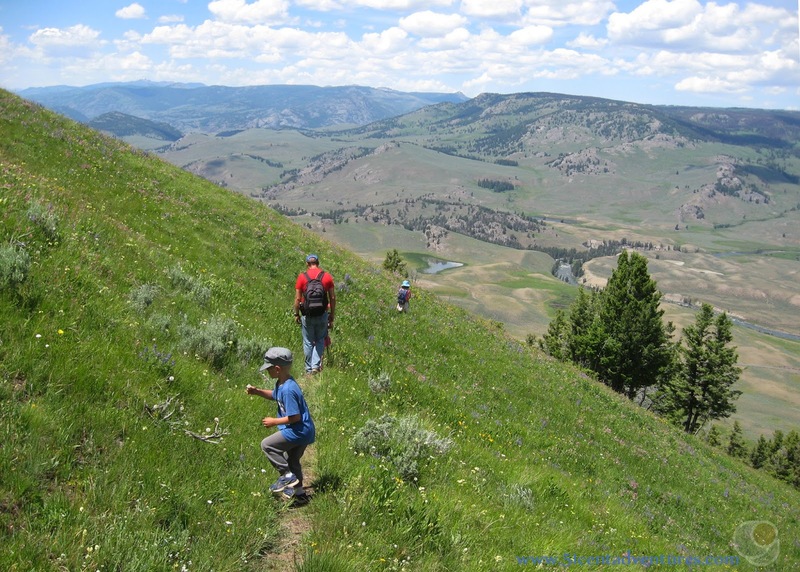 Places Nearby: Roosevelt Lodge to the west or the Lamar Valley to the east are both great places to go when you are done with this hike. Roosevelt Lodge offers dinning options and an opportunity to relax on the lodge's famous porch. The Lamar Valley is full of wildlife and usually short on tourists.